Lee,This is Dave’s handler Peter Hayes. Tonight in Whitehorse was the Start Banquet, and Dave drew #9, the same number as last year. The first musher leaves the chute at 11:00am, and the others leave in 3-minute intervals, a change from the 2-minute intervals in previous years. The race starts this Saturday, Feb. 10, and Dave will leave at 11:24am. Currently he has 16 dogs to choose from, and Dave will decide on the final 14 as he gets closer to the start of the race. The Canadian Rangers, the ones who break and groom the trail, said the trail to Dawson is the best they’ve seen in years. Today’s weather was 14 degrees Fahrenheit, and a little breezy. Colder temps are expected for the start. I was one of Dave’s handlers during the 2004 Yukon Quest, where Dave finished in 3rd place, with all 14 dogs. I have your email address as well as phone #; I’ll try to give personal updates to you as often as I can. It will most likely be via telephone, as there will be infrequent internet connections along the trail at the checkpoints. While in Whitehorse we are staying with our host family, the Kitchens. Tomorrow morning, Friday Feb. 9th, we will take the dogs on a short exercise run of about 8 miles, then in the afternoon give a short presentation at Marika (age 7) and Annette (age 12) Kitchen’s elementary school, about the Yukon Quest and dog mushing in general. 2/10/07Well the Quest has started. 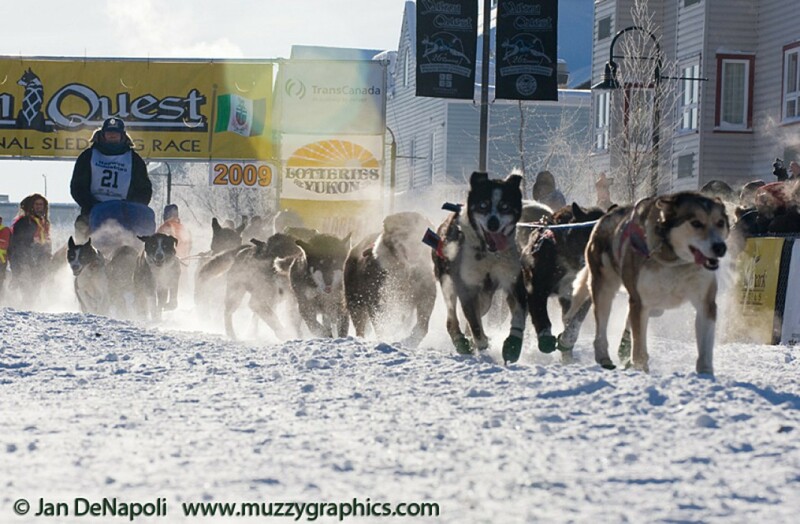 I got the following E-Mail from Peter:The weather this morning for the start of the 2007 Yukon Quest International Sled Dog Race was perfect: downtown Whitehorse was full of clear, sunny skies and the temperature was -10 degrees Fahrenheit – a great day for running dogs! Dave got off to a great start, 9th in line, out of 28 mushers. His dogs are in great athletic shape and very strong, so he should have a good, competitive race this year.The race’s first checkpoint is at a truckstop (which serves world-famous cinnamon buns) in the small town of Braeburn. It is 100 trail miles from Whitehorse, and each musher must take a mandatory 2 hour break there. With Dave’s anticipated run/rest schedule, he should be arriving at about 8:00am Sunday morning. 02/11/07 Dave is in and out of Brayburn at 4:49 this morning with 14 dogs in 4th place. 02/11/07 Update!!!! Dave is into Carmacks at Number 2. 30 minutes behind Lance Mackey and both with 14 dogs. 02/12/07 News from Peter and Dave is in to Pelly Crossing and is listed as 5th. with 12 dogs. Pelly Crossing, Yukon Monday, February 12 12:28 PMDave Dalton left Braeburn early Sunday morning, February 11 at 4:49 AM and ran for 9 hours, 10 minutes to arrive at Carmacks at 1:59 PM. He left Carmacks Sunday night, afer resting for 8 hours, 2 minutes (and dropping two dogs, Oliver and Hoonah) at 10:01 PM. The next checkpoint is Pelly Crossing, 73 trail miles away.Dave then ran for 9 hours, 45 minutes to arrive at Pelly at 7:46 AM, Monday morning, February 12. Over the next few days the weather is expected to warm up on the trail to Scroggie Creek, and Dave says that since the dogs are holding up well he will continue his 8-hour run/rest schedule going into Dawson. 02/13/07 Update from the Trail Dave is in and out of Stepping Stone and news from Peter.Dave was the 8th musher to leave the Pelly Crossing checkpoint this afternoon, at 3:30 PM, after resting for 7 hours, 44 minutes. The next dog drop is at Scroggie Creek, and it is only accessible by air. So the next time handlers will see their mushers is at Dawson City, the race’s halfway point, 201 trail miles away… so wish Dave luck and speed over the next few days! 02/14/07 Dave is into Dawson and will be able to leave 2/16/07 at 4:00 AM. He is about 14 hours behind the leaders in 9th place with 11 dogs. 12:10 PM Friday, February 16Dave left Dawson City at 4:01 AM this morning, with 11 dogs. John Schandelmeier left 8 minutes earlier at 3:53 AM. They are the two front runners of the middle of the pack. There is roughly a 6-10 hour gap between them and the top 8 front runners. Dave’s closest competition at this point is Schandelmeier, Mike Jayne, Richie Beattie, and Brent Sass, who all left around 7:00 AM this morning. William Hanes left at 11:57 AM, and the next scheduled departure is Russ Bybee at 1:35 PM.During their stay in camp the dogs got plenty of rest and ate well. The race veterinarians commented on how healthy they are and how good they looked. Looking back on the first half of the race, Dave said his running schedule between Braeburn and Pelly Crossing may have been ‘too much-too soon’ for the dogs; Dave ran the legs from Braeburn to Carmacks and from Carmacks to Pelly (each just under 80 miles) in long, straight stretches and that might have been too much for them, which is why they are a bit tired now and performing a little slower than expected. The dogs’ training regimen consisted of 80 mile runs, but with lots of rest in between, not the day after day, back-to-back pace of racing. 02/17/07 I am sorry I didn’t get this update in sooner. The internet to Unalaska was down last night. Dave is in Eagle at about 9:40 this morning. Here is an update from Peter. 02/18/07 Dave is out of Eagle as of 4:15 yesterday we should see him into Slavins Cabin today. Lance Mackey and Hans Gatt are in Circle. Dave is still running 9th with 11 dogs. John Shandelmeier is behind Dave about an hour. Peter has the long drive from Dawson to Circle about 1500 miles. 02/18/07 Dave has left Slavins at 8:00 and is on his way to Circle in 9th place with 11 dogs. 02/19/07 Dave is out of Circle at 1:00 this afternoon about 5 hours behind Aaron Burmeister with 11 dogs. Lance Mackey is on his way to Chena Hot Springs. 02/19/07 Dave is in Circle. Lance Mackey has reached Mile 101. It is his race to win. Hans Gatt is following out of Central but only has 8 dogs left. Dave still has 11. He is followed by John Schandelmeier within minutes. 02/19/07 Here are some comments from Peter. Also Pictures from the Trail in YQ 2007 Pics on the Left. As of 7 AM Monday, February 19, 7 AM Dave is still on his way to Circle City. Temperatures at night dropped to -50 degrees Fahrenheit, causing mushers Hugh Neff, Sebastian Schnuelle and Aaron Burmeister to stay longer in Circle and rest overnight. The cold weather is also what is probably slowing down Dave Dalton, John Schandelmeier and Mike Jayne, the last group of mushers to leave Slaven’s Cabin. They most likely camped out on the trail during the night to wait out the cold, and are expected in Circle very soon. 02/20/07 Dave is in Mile 101 around 2:00 this afternoon. He still has 11 dogs and is racing with John Schandelmeier in 9th and 10th place respectfully. Lance Mackey won the Quest today in record time followed by Hans Gatt. Other positions are still in question. 02/21/07 Dave is on his way to Fairbanks Racing with John Schandelmeier for 10th place. Trail news from Peter. New Pictures in 2007 Racing on the left. 2-21-07 11:46 AM Chena Hot SpringsDave Dalton and John Schandelmeier arrived at the Chena Hot Springs Resort checkpoint at 2:38 & 2:41 AM early this morning. After resting for their mandatory 8-hour layover they decided to rest an additional 4 hours; the Quest veterans are comfortable traveling the final stretch together, and are in no hurry since the next musher, William Hanes, is over 18 hours behind them. They have a lock on 10th & 11th place. They want to rest the dogs as much as possible for the last leg to the finish line, as well as take advantage of the hot, rejuvenating waters of the resort. Dave still is still running with 11 healthy (but tired) dogs, and should arrive at the finish line in Fairbanks around 2:00 AM Thursday morning. 02/22/07 Dave is in Fairbanks this afternoon in the tenth place beating John Schandelmeier by about 50 minutes. Congratulations to Dave for another Top ten Yukon Quest Finish !!!!!!!!! 02/23/07 Dave called in from Healy where he has bedded down all the dogs. He has two new rookie finishers in the team giving him 16 finishers in the kennel. He said it was a long cold race and he pushed too hard at the start. He said he will return to his finishing strategy for next year. I asked how Eagle summit was this year and he said it was one of the roughest ever. “The dogs almost quit on me going up the slope” With a little tough love we made it to the top. He convinced John Schandelmeier to stay the extra 4 hours at Chena Hot Springs and they both agreed to relax and let the dogs get the extra rest. He is on his way to Fairbanks for the finish banquet tonight. When asked if he would do anymore racing this year, he said no, he would get the dogs ready for the Glacier this summer and take it easy till then.